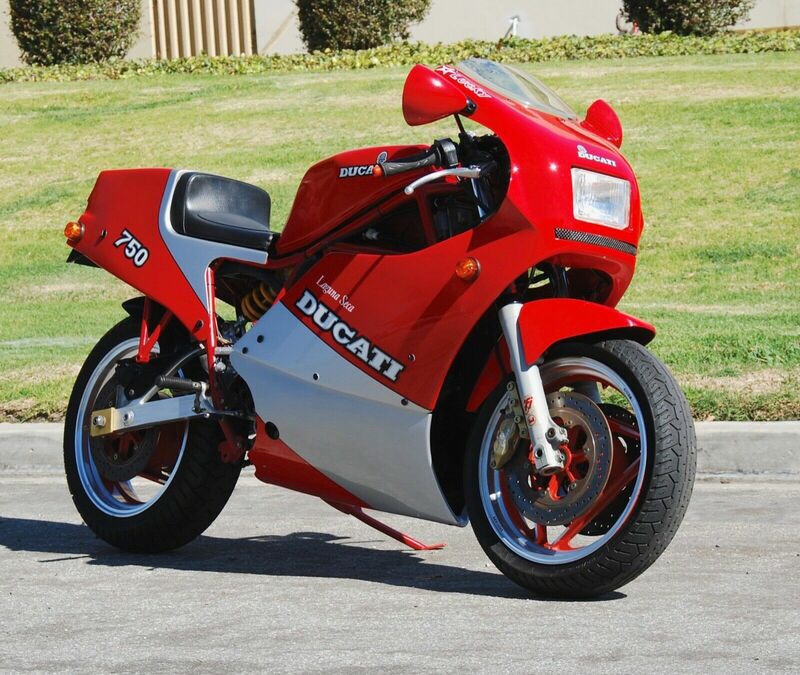 Considered by many enthusiasts to be the last of the ‘real’ Ducatis, the race-styled 750 F1 first appeared in 1985. 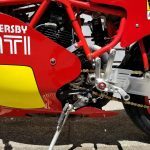 Ducati had already enjoyed considerable success with its Pantah-derived F2 racers in FIM Formula 2 racing – Tony Rutter winning the championship four-times running between 1981 and 1984 – so a ‘750’ version was the logical next step. 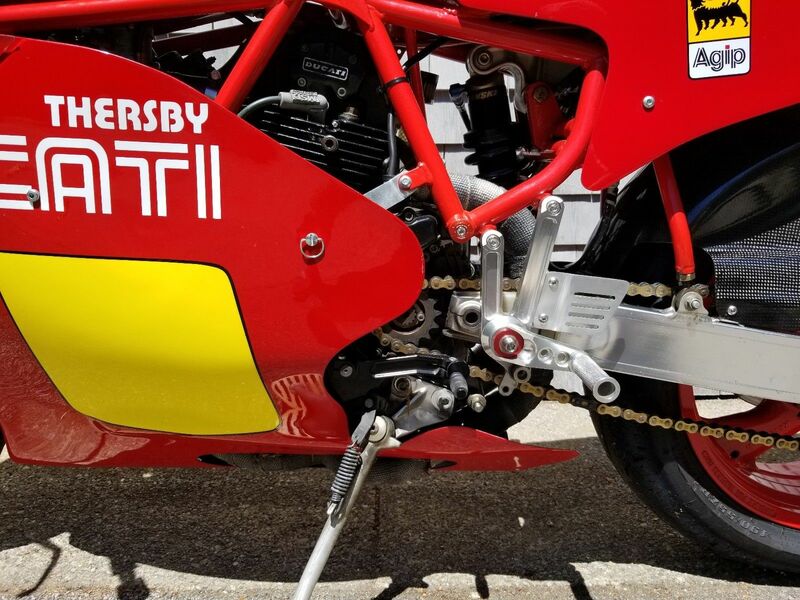 First seen in prototype form in endurance races in 1983, the F1’s 748cc engine was the latest in a long line of stretches applied to the original 500c ‘belt drive’ Desmo unit that had first appeared in the Pantah in 1979 – a street-legal updated version of the mid-’80s TT1. 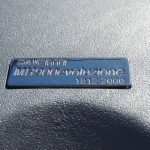 A markedly over-square design of 88×61.5mm bore/stroke, the F1 engine produced around 60bhp and functioned as a stressed element within the frame, the swinging arm pivoting in the rear of the gearbox. 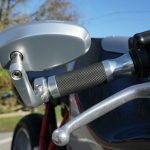 Clearly visible above the deliberately cut away fairing sides, the aforementioned frame attracted almost as much attention as the engine: a trellis of short, straight tubes, it has formed the basis of every road-going Ducati since, as well as the first Desmosedici Moto GP racers. In the fashion of the day, the F1 came with a 16-inch front wheel, while braking power was provided by state-of-the-art triple Brembos. 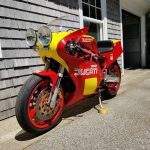 The stock F1 was complemented by a series of hand-built, limited edition, race replicas – Montjuich, Santamonica and Laguna Seca – the last inspired by Marco “Lucky” Lucchinelli’s famous ‘Battle of the Twins’ race victory at Daytona in 1986. 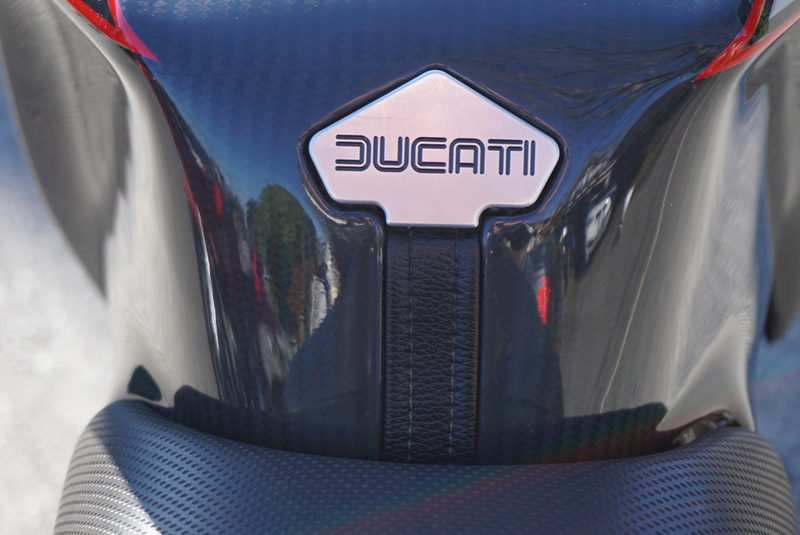 Today the evocatively named F1 and its derivatives are highly prized by Ducati collectors. 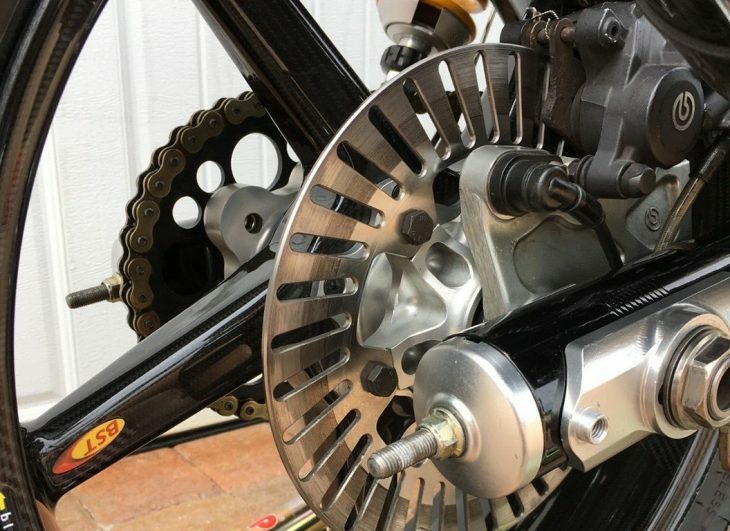 Much like the Montjuich, the Laguna Seca came with bigger Dell’Orto carburetors, higher compression ratio, bigger valves, and straight-cut primary drive gears. And talk of 95bhp at 10,000rpm! But unlike the Montjuich, it came with a larger, quieter muffler. Not a lot of history about this particular example, although the read is a good one (reminds me of Ian Faloon). 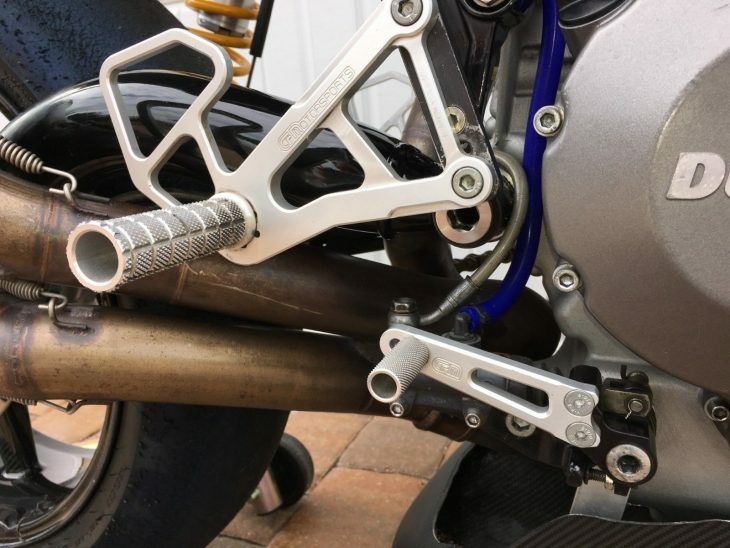 The only point of note I see on this bike is the non-standard Ohlins external shock reservoir strapped to the left side of the iconic trestle frame chassis (original shock was a Marzocchi PVS 4). Any other changes are unknown with the facts given, and with only 3 pictures to work with there are many questions left unanswered. But with only 6,500 miles, this beauty is undoubtedly clean and very rare. I'm not sure if proper etiquette deems we refer to this as the WeatherTech Raceway Laguna Seca, nee Mazda Raceway Laguna Seca, nee Laguna Seca Raceway, but the connection is very clear. Also clear is the asking price: a not insignificant $24,900. 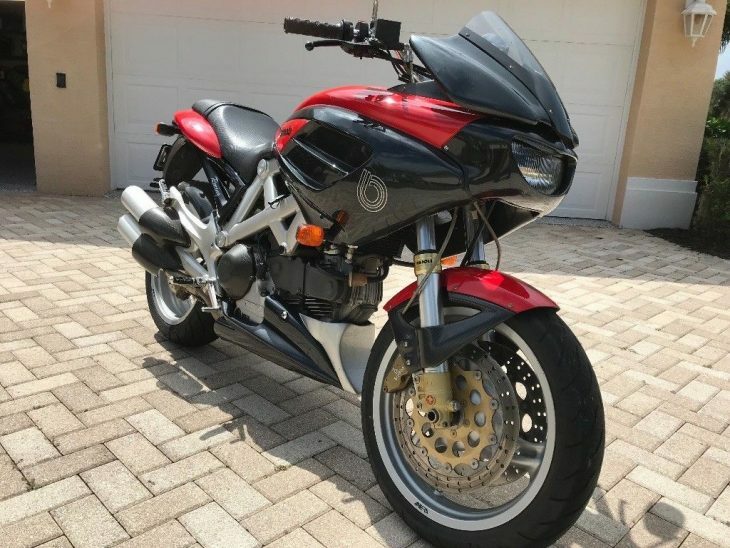 That is a bit higher than we usually see these bikes offered - although the seller appears open to a lesser figure - so if you're in the market for one of these beautiful and rare model Pantahs you should act quickly. 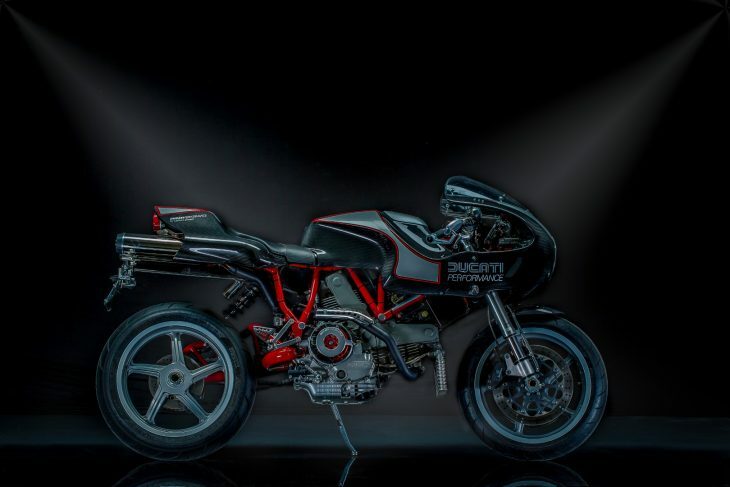 Check it out here, and then jump back to the comments and share your thoughts on the F1 model Ducatis: are you a fan? Good Luck!! 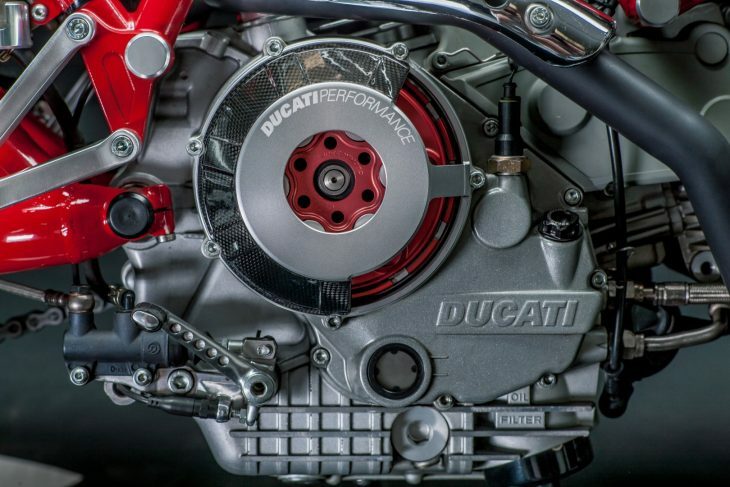 Ducati's two-valve engine variants have long been seen as the affordable, low-performance option for novice or "mature" riders and bikes far from the leading edge of performance. 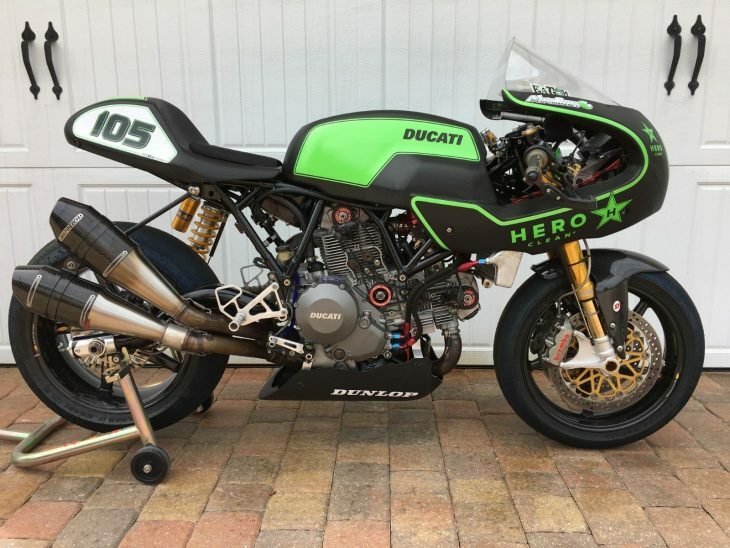 Which makes the choice of an air and oil-cooled Ducati Sport Classic as the foundation for a high-performance racing machine like this highly-developed example pretty surprising. When the liquid-cooled, four-valve Desmoquattro engine was introduced, it instantly relegated the original Pantah engine and its descendants to second-tier status. 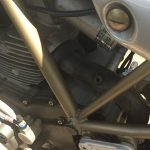 But in the early 1980s, the oil and air-cooled two-valve v-twin, newly updated with toothed rubber belts to drive the single overhead cams instead of the classic tower shafts and bevel gears, it was their only engine and, as such, it was developed with competition in mind. The main point here being that you shouldn't dismiss it as a racing powerplant simply because its been surpassed in terms of outright performance. 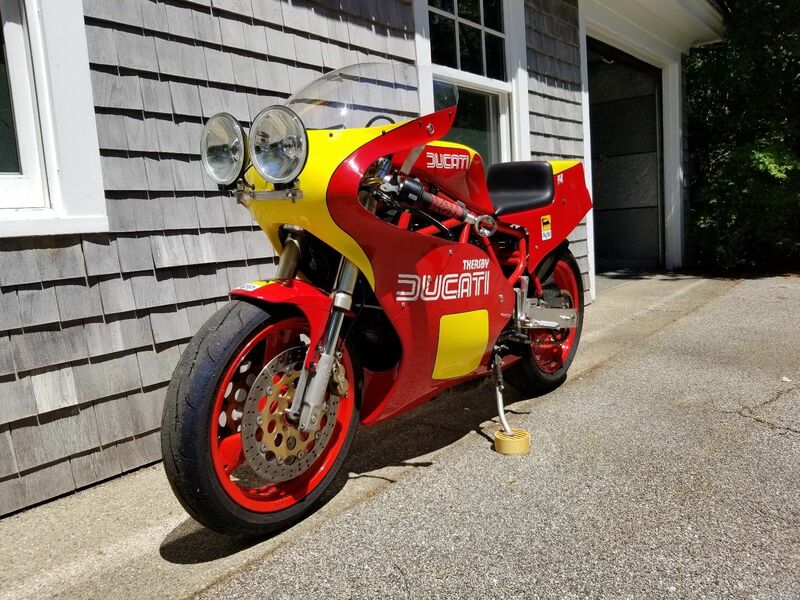 The Ducati's Sport Classic line might not have offered up Superbike power-to-weight ratios, but the engine's durability and the frame's inherent rightness mean that you can build a pretty competitive machine out of one, assuming you find the right class in which to participate. 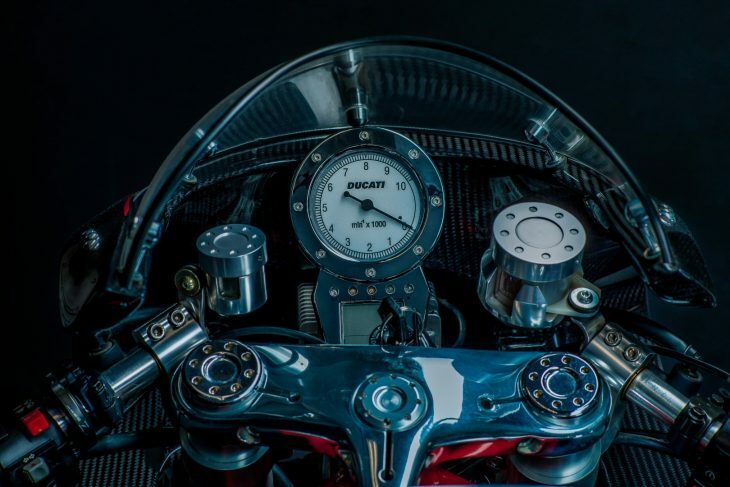 The 992cc original engine might be torque-rich and involving, but in order to be competitive, this one has been punched out to a little over 1200cc with a raft of NCR components. The result is a claimed 140hp at the rear wheel, up from 92 in the original. 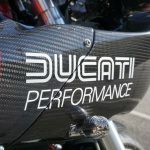 If you're not interested in competing on the bleeding edge, either because of the exorbitant costs involved, or simply lack the talent possessed by only a handful of riders worldwide able to to compete at the highest levels and win , this might provide you with a more budget-friendly option, although it's still pretty far from cheap, at $54,000. Extensive spares package is available for addition charge. 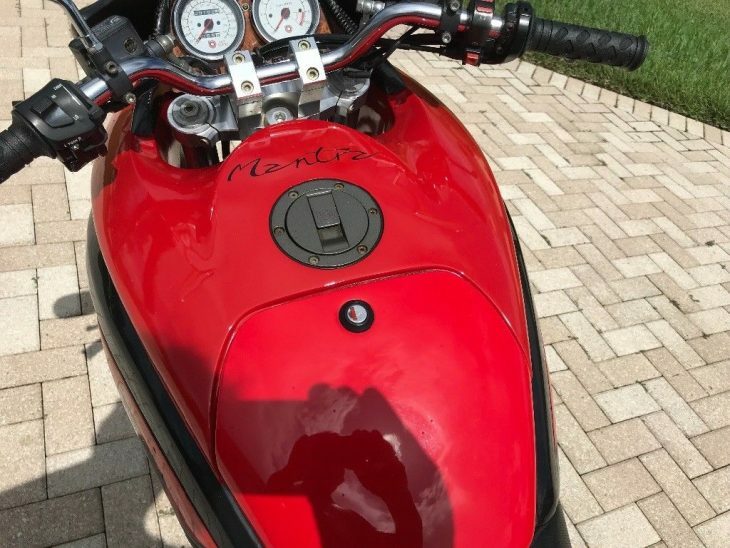 VIN number listed is arbitrary; VIN number area has been painted over; sale is without title; eBay requires listing title information otherwise unable to post sale; there is no title offered with this race bike, just bill of sale. Should you be also interested in the sister bike listed in my other auction, a "race team" deal with spares package can be arranged. I can arrange free pickup to regional CCS/ASRA, WERA and AHRMA events on the East Coast; I will assist with shipping domestic and foreign. Please don’t hesitate to contact me with any questions, adjustments in the auction, etc. I pride myself in telling it like it is. If for any reason my description of this item isn't correct, I will gladly refund your money. Having a perfect feedback rating is very important to me and I plan on keeping it, so I don't play games. Looking at that list of go-fast goodies, it's pretty clear that no expense was spared in building this thundering v-twin racebike. 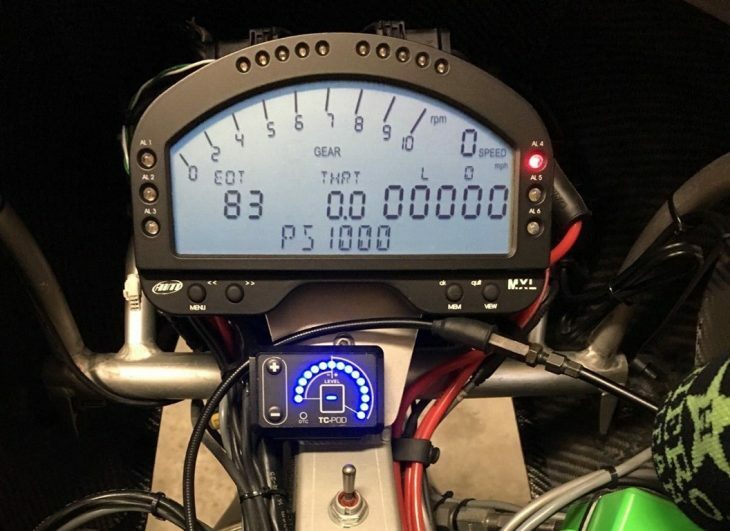 140 rwhp is nothing to scoff at, especially given the bike's probable weight: a new Paul Smart weighed in at around 414lbs dry so this one should be a good chunk less without all the lighting and other road gear. And that's before you even get into lightweight parts that decorate this machine. 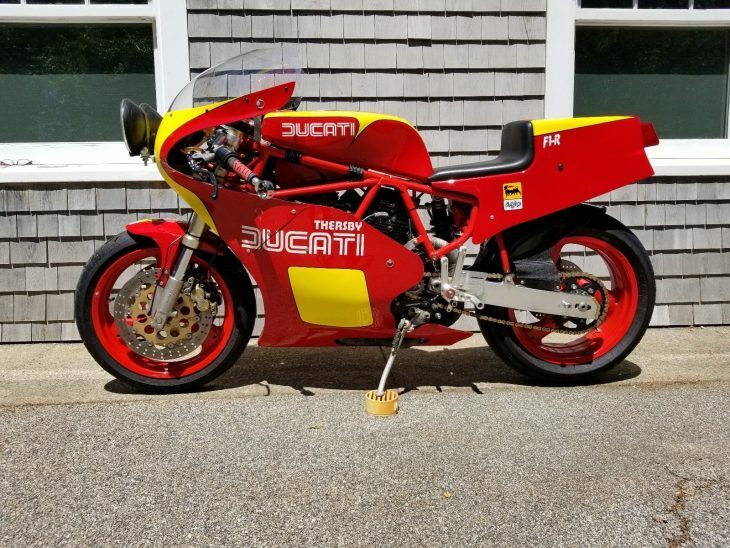 It's all top-shelf, and a ridiculous amount of money to throw at an obsolete v-twin sportbike, but if I were a rich guy, it's exactly the kind of track day toy I'd want in my garage. 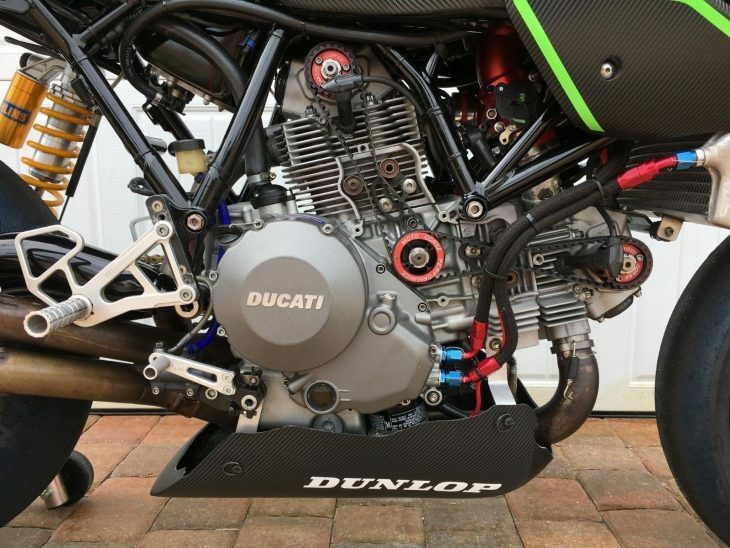 Liquid-cooled Ducatis might be faster, but I still think that the air-cooled two-valve engines sound much better, and the punchy midrange, here amplified to epic levels, should provide plenty of entertainment for experienced track day riders and racers alike. I appreciate simplicity. Simple HVAC knobs on a car's center stack. Black coffee. 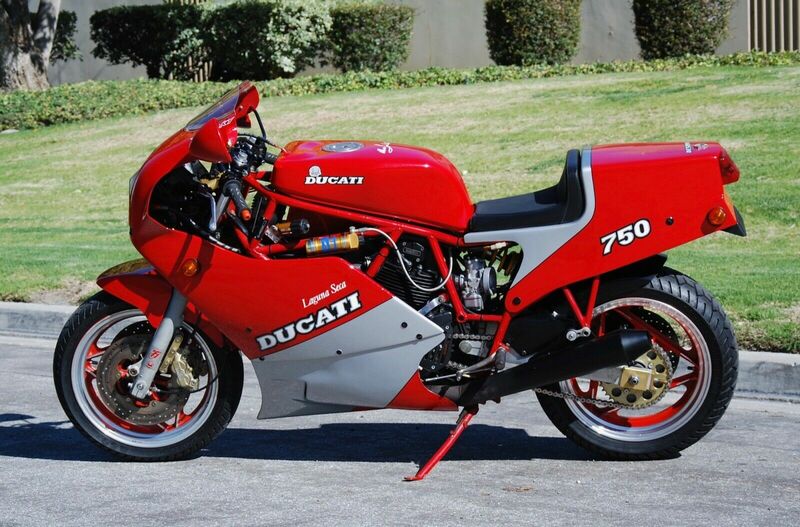 Bikes like the Ducati 900SS FE. Modern technology is great, but if you've seen the new Ducati Panigale V4 with the bodywork removed, you realize that the cost is massive complexity and the knowledge that, if something goes wrong once the bike is out of warranty, things could get expensive really fast... And while TCS and cornering ABS are really great ways to keep even experienced motorcyclists safe, some of these bikes are so powerful that you need electronics just to rein in the wild performance. But bikes like the 900SS manage to be both entertaining and very simple, suggesting that maybe we've gotten lost somewhere along the way. "FE" stands for "Final Edition" and was obviously a way to sell a few blinged-up examples of the stone-axe simple Supersport before an updated version arrived in 1999 that used bronze in place of chipped flint. 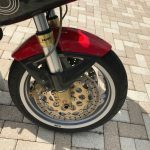 The bike is almost painfully basic: it's powered by Ducati's 904cc air-cooled two-valve v-twin, fed by a pair of Mikuni CV carbs and backed by a six-speed gearbox, now with extra Dry Clutch Rattle™. There are no variable power modes. There is no traction control, no ABS. 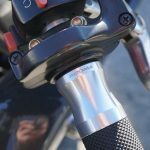 No electronically-actuated exhaust flappers or phased variable cam lobes, heated grips, GI Joe Kung-Fu Grips, or cellphone charging ports. 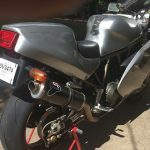 What you do get is Ducati's charismatic 900SS with a solo tail, upswept exhaust pipes that increase cornering clearance, and a numbered plaque on the top triple clamp. Just to show that you're one of 300 very special people. Obviously, the 84 claimed horses aren't going to impress anyone these days, and honestly they didn't even when the 900SS was brand new. 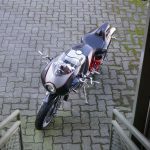 But the bike is relatively light, the geometry race-bred, the brakes relatively strong, and the engine flexible and fun. A bike like this is never going to win in a spec-sheet bang-for-your-buck competition, and anyone who dismisses this bike as being "overhyped and slow" is probably missing the point. 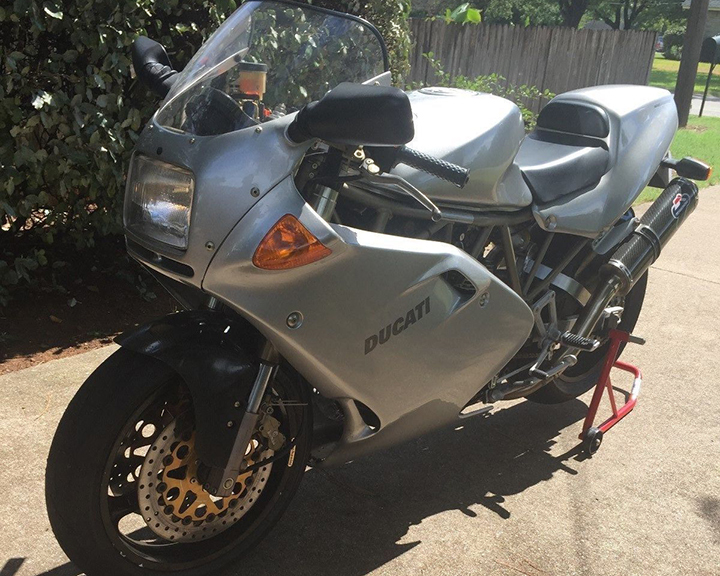 Ducati 900 SS FE, 1998. #193/300. 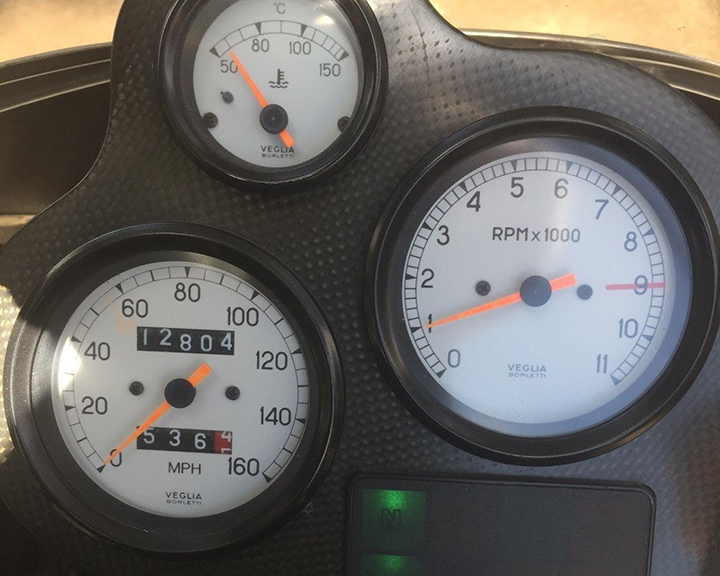 12,804 miles, bike is in excel cond. 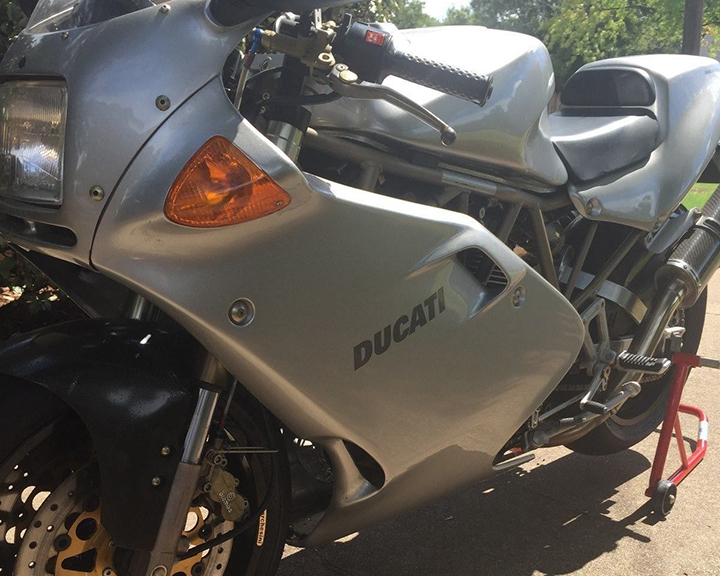 Serviced at Ducati Dallas, valves adjusted, timing belts, Motul oil and filter, fuel filter, K&N air filter, etc. 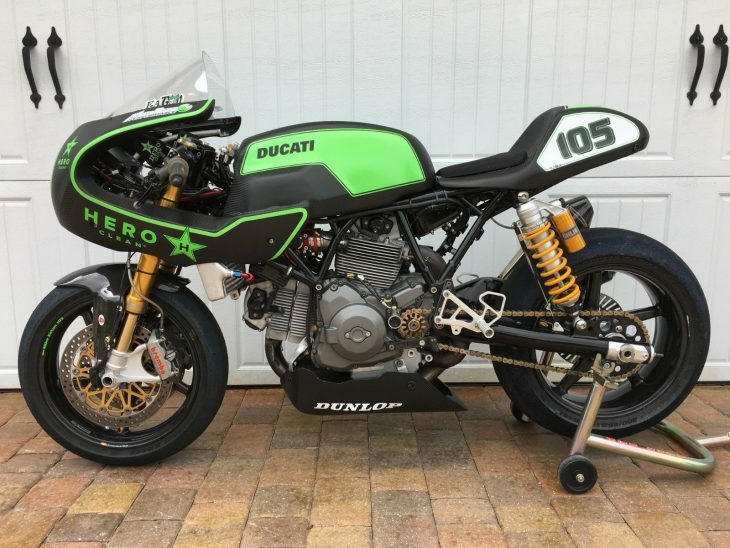 Bike has 3 spoke Marchesini magnesium wheels, braided stainless hydraulic lines, Termignoni carbon high mount mufflers, carbon tank protector. These bikes are getting hard to find in this cond, this is a nice running and riding Supersport. 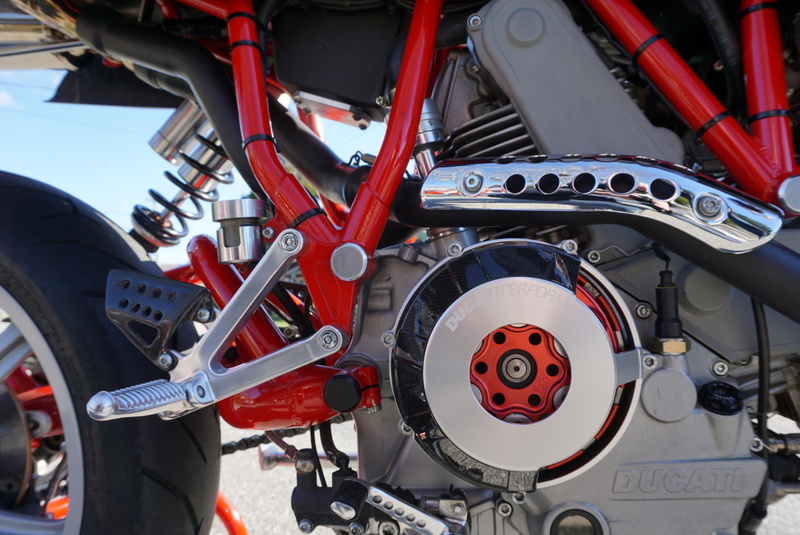 This one appears basically stock, with the addition of magnesium wheels, stainless brake lines, and Termi pipes. All of which are things I'd want on my very own 900SS, and upgrades that are generally acceptable among collectors. 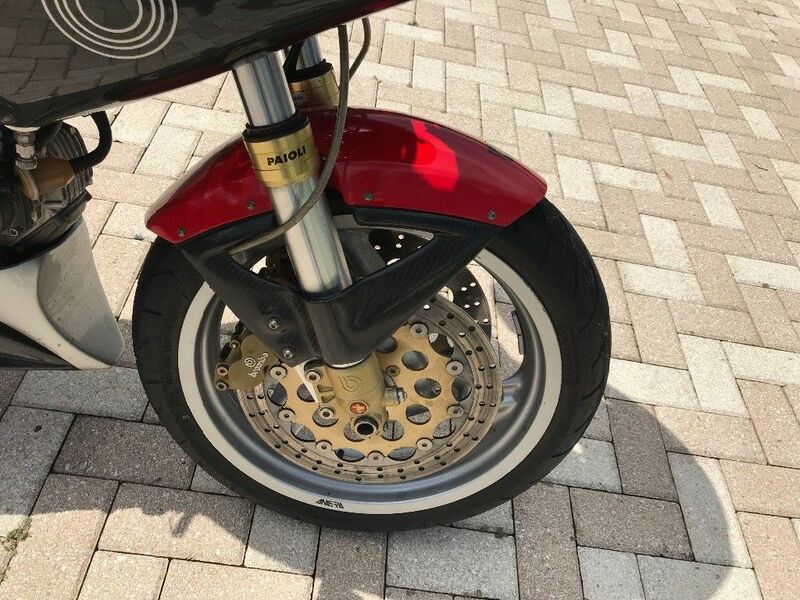 Note that the pictures appear to show the stock FE wheels, which I don't believe were magnesium, as the owner claims. 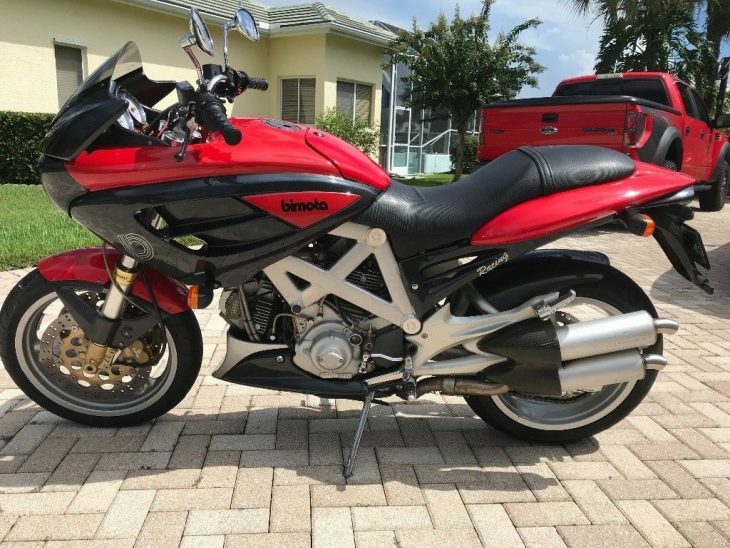 Miles aren't barn-find low, but very reasonable for a machine this old, and should give a new owner room to add some without decreasing the bike's value significantly. Because the point of this bike is to ride it. Bimota's stock-in-trade has always been aggressive, lightweight racebikes for the road but, every once in a while, they throw us a curveball. Or even the occasional knuckleball like this DB3 Mantra. 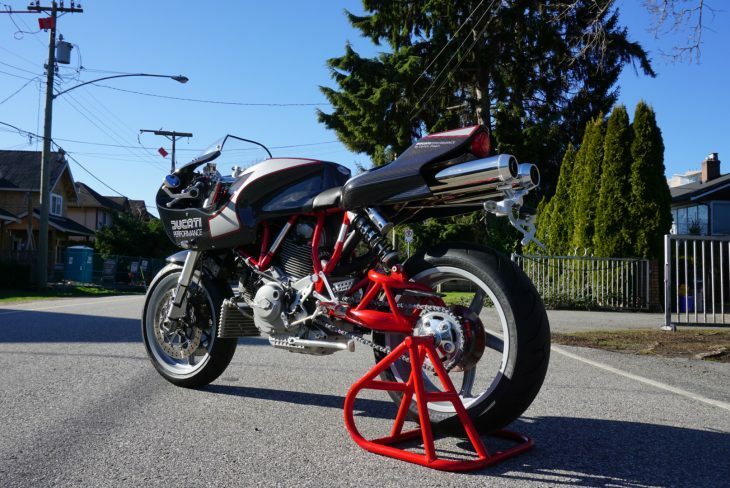 An unapologetically road-biased machine, Bimota's third Ducati-powered special featured upright ergonomics, an oval-section trellis frame shared with the later DB4, a roto-molded fuel tank that included a storage cubby at the back in an ill-advised nod to practicality, and styling could be called "wild" if you were feeling gracious. 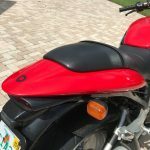 It was polarizing then and now, but if you like the looks, you shouldn't let anything discourage you from buying one: the hard parts are all easy to service, reliable, and pretty entertaining. 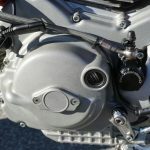 Ducati's air and oil-cooled two-valve v-twin has been around forever, and is relatively simple to service and parts are readily available to maintain them. Yeah, the regular belt-changes are kind of annoying, but easy to do if you know your way around an engine, and the valves generally aren't too much of a problem either. 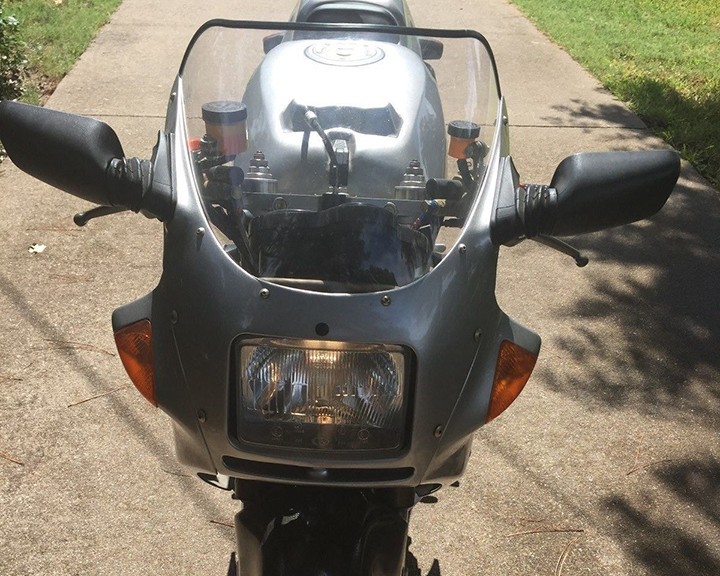 And if the bike's 85 claimed horses from the 904cc twin don't adequately blow your hair back, you can build yourself a high-compression, 944cc monster that should do a pretty good job of stretching your arms. The styling was slightly insane, but the bike handled very well, with a 43mm Paioli fork out front and an adjustable Paioli shock out back. The oval-section trellis frame was stiff and very light: just 11 pounds. Basically, it was a lighter, weirder, much more expensive Monster with better suspension. Like all Bimotas, it makes no sense from a financial perspective, as performance advantages over a Monster that cost half as much were minimal. 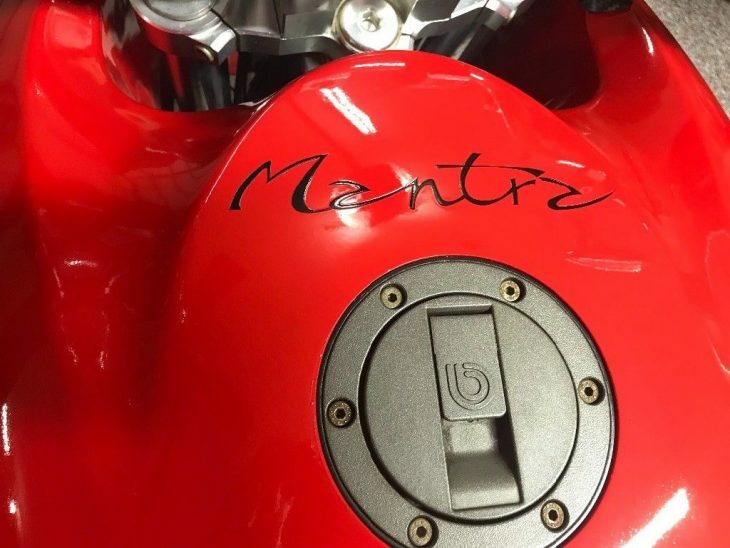 But 454 Mantras found buyers, which makes the bike pretty much volume production for Bimota. A: Have that plastic, burl-wood dash replaced with something stupid, like genuine wood or some nice carbon fiber. B: Replace the horrible four exhaust pipes and the ludicrously-styled hangars with something much simpler. Remove the taller screen, fit some simple bar-end mirrors and have fun. This is an excellent example of a DB3. 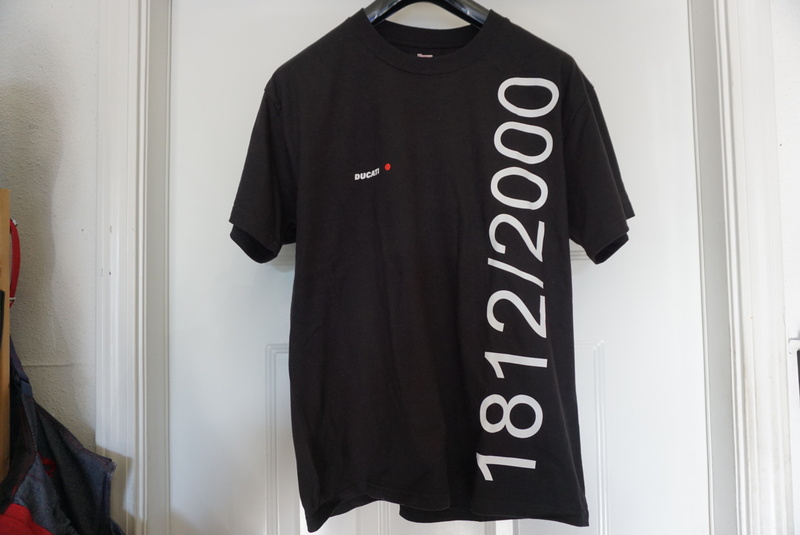 400+ made, 23 in red. Very few in the US. Very low mileage at under 9200. 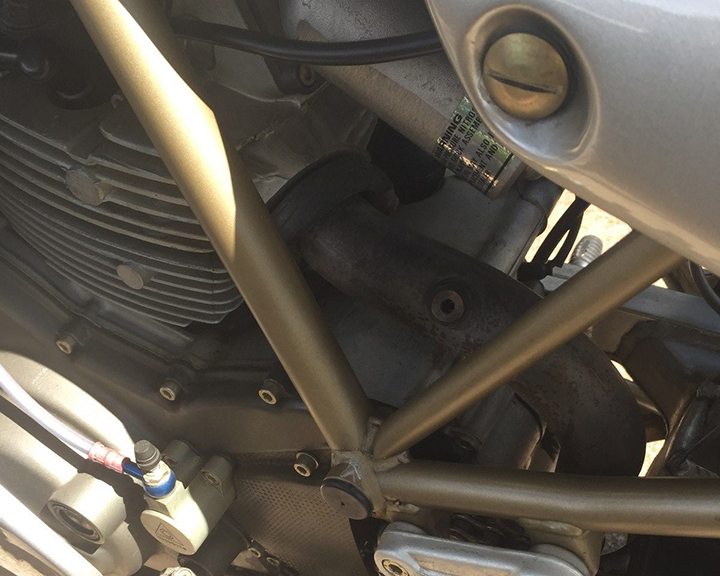 Ducati 900 engine just has been serviced with new belts, oil and plugs. New AGM battery. New Conti tires. Previous owner removed the complicated fuel pump system and now it is just gravity fed. Here are the 3 issues. 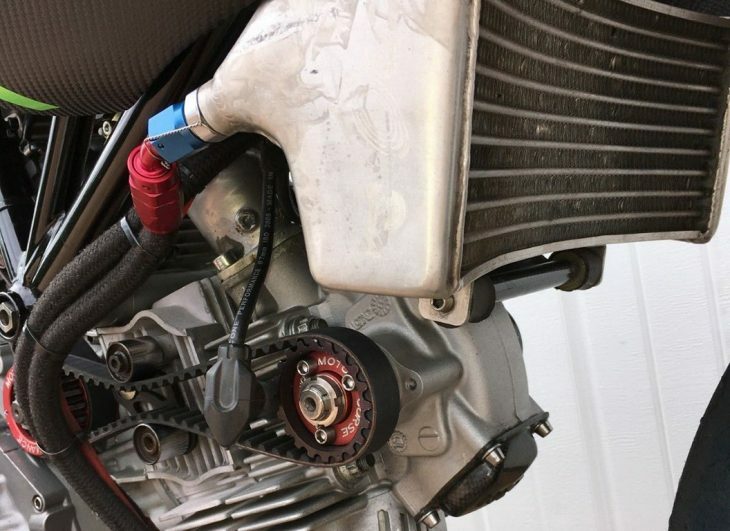 Without a choke cable, it is a little hard starting until fuel gets in the carbs. With a cable, I imagine it would go on the first try. Once started, restarts fine. Tach works 50% if the time, loose connection? Lastly has a slight whistle noise at an exact rpm. 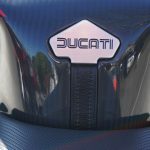 Ducati said it is caused by lack of the factory air box. It hurts nothing, just the flow of air... These are 3 minute things, but I go for full transparency. The bike is in great shape. Very unique Italian styling. 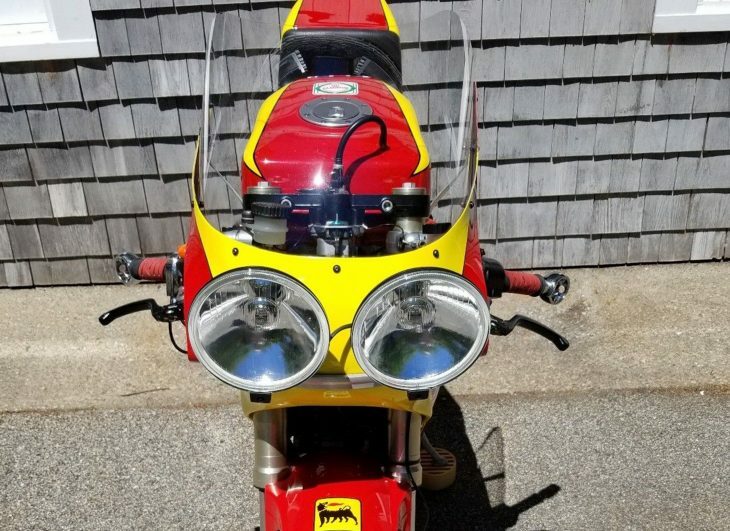 "Very unique Italian styling" might be the epitome of understatement in this case. But the bones are good and the DB3 should make a pretty great weekend roadster for cruising, carving up traffic, and shocking onlookers. "What is that?" is something I'd expect you'll hear pretty often, riding the Mantra. So what's it worth? 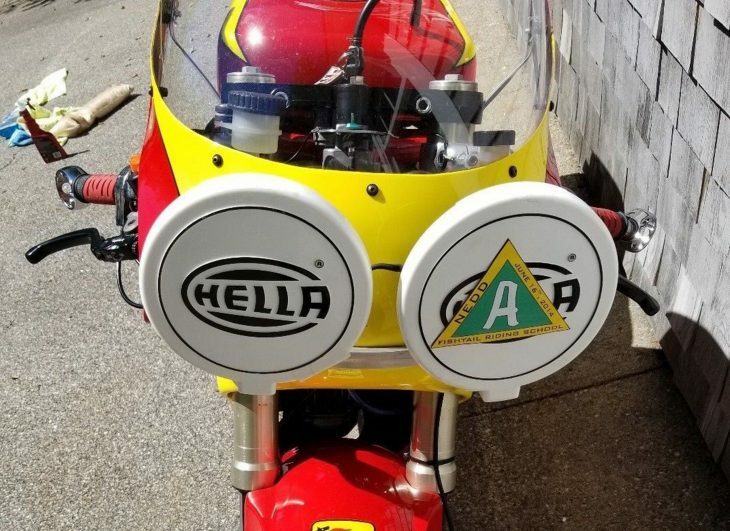 Well the Bimota pedigree and rarity certainly makes it more valuable than an equivalent 900SS or Monster powered by the same engine, with similar performance. But by how much? Values for 90s Bimotas are currently at a bit of a low-ebb, although I doubt that can continue forever. Bidding on this one is very active and up to just about $5,000 with another day left on the auction. 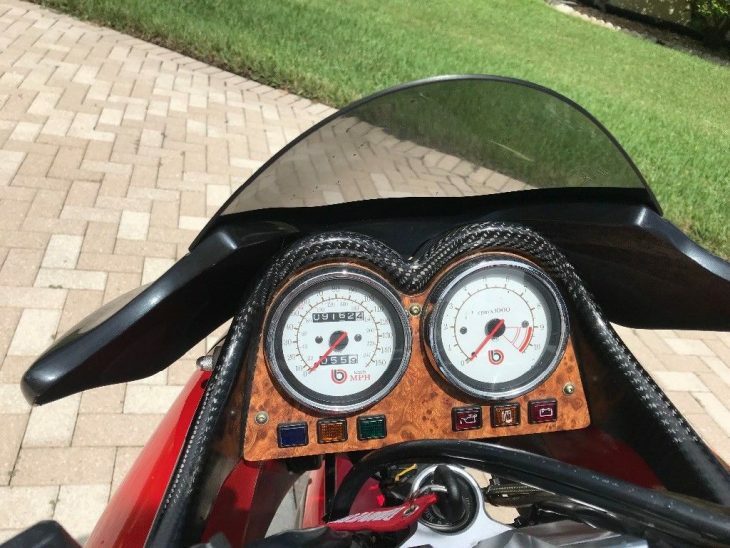 The original listing for this 1995 Ducati TT2 Replica includes some good general information, but I'd love more specific details about the components. The seller mentions the frame was supplied by Roy Thersby, but did he build the frame, modify the frame, or just paint it? 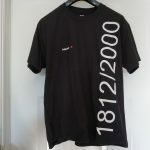 At a glance, it appears to be from a 90s SuperSport, which makes sense, considering the rest of the running gear. 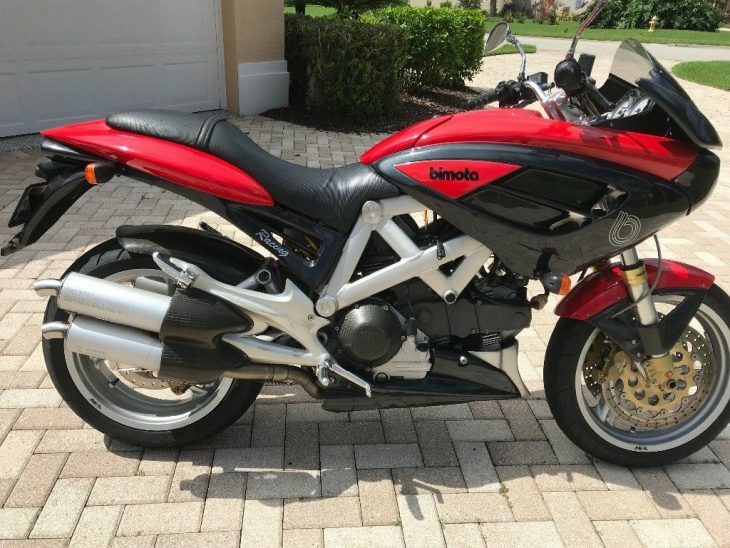 So it appears that what we're dealing with here is a fully-built 90s 750SS with brilliant retro-bodywork and paint. And headlamps. Those massive, retina-burning headlamps. 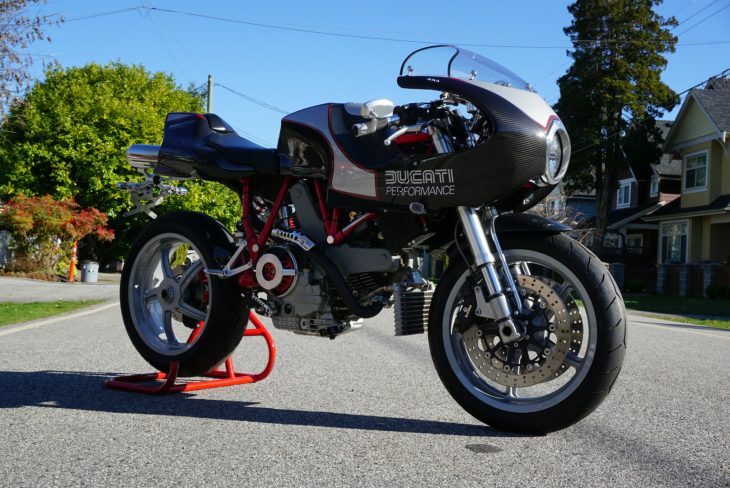 The original TT2 that inspired this build was a lightweight, Pantah-powered racebike displacing 597cc with a Verlicchi frame and Marzocchi suspension. 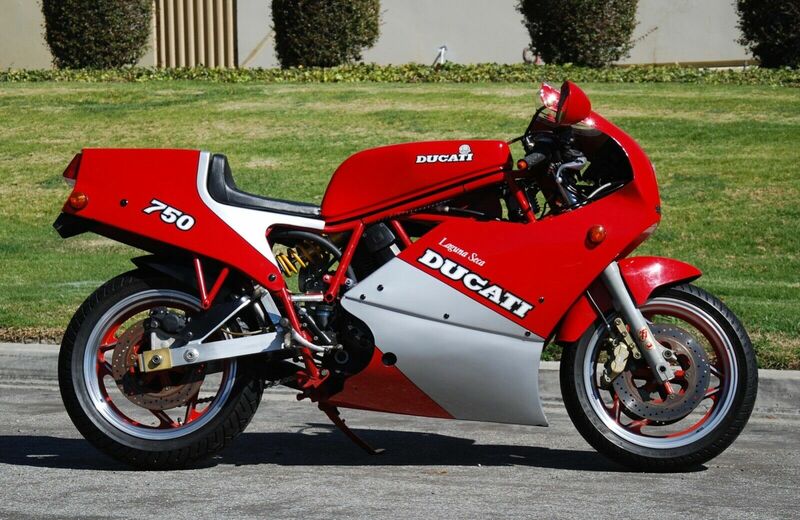 Built between 1980 and 1984 the bike was very successful in competition and ultimately spawned the Ducati F1 road bike. 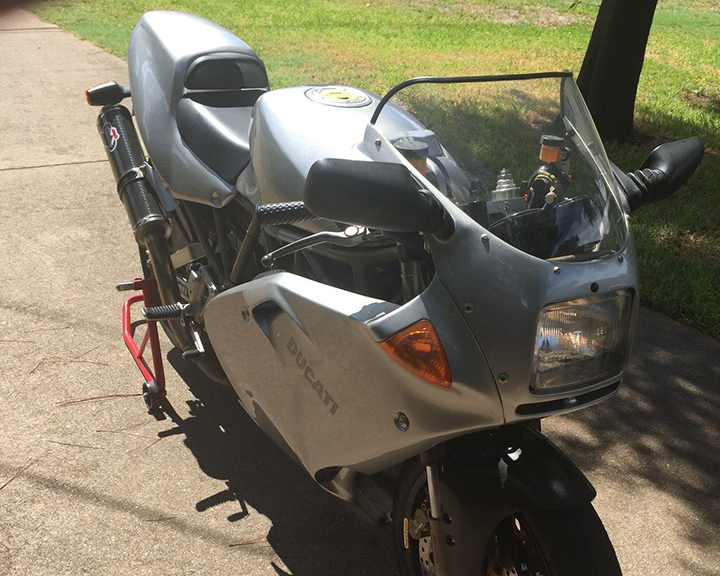 The engine in this replica is a 750, but it's looks to be the 90s version, since both carburetors live in the engine's vee: the 80s Pantah-engined bikes had both facing rearward, with the vertical cylinder's jutting out awkwardly towards the rider's knee. And the wheels are clearly 17" parts, in keeping with the 90s theme. Great for finding modern, sticky rubber, but not the most authentic-looking, if that's the goal, since the original used 18" hoops. 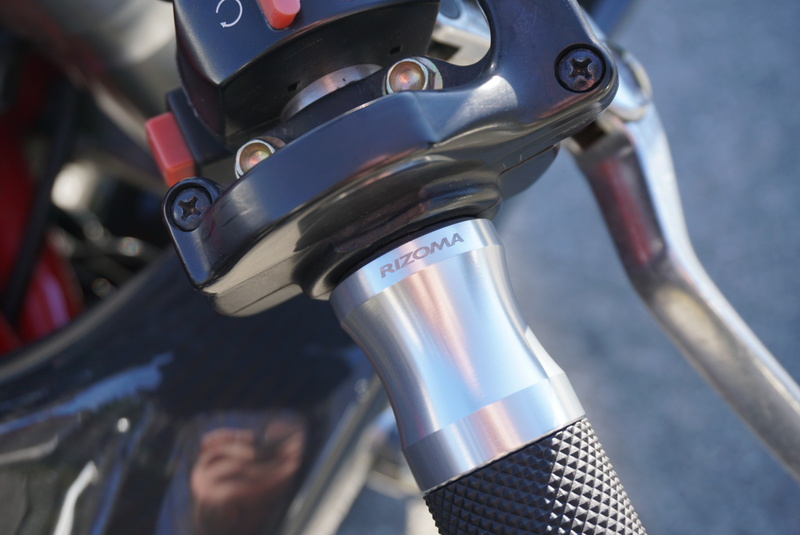 And why choose non-adjustable front forks on this bike? 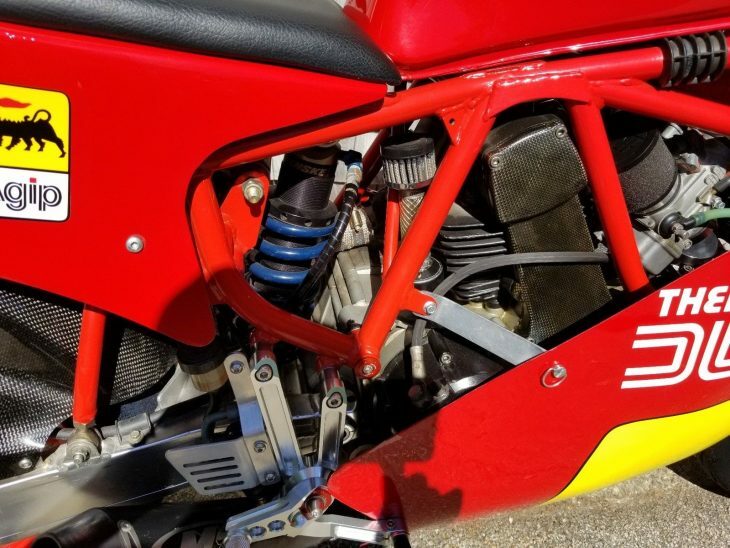 Even set up properly, I'm surprised the builder didn't at least use the adjustable units available on certain 900SS models, since the upside-down forks give the game away anyway that this isn't really an 80s race bike. Not doubting the craftsmanship, but there are some other choices I'm not big on, starting with the Koso instruments. I'm sure they're reliable and legible, but I don't really like them on recent Bimotas and I really don't like them on a retro-looking special. Something classic from MotoGadget would have given similar function with a much more appropriate look. 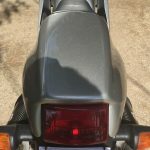 The bar-end signals are a cool touch, but a bit too shiny for my taste and the grips and Union Jack tank pad are way too modern. 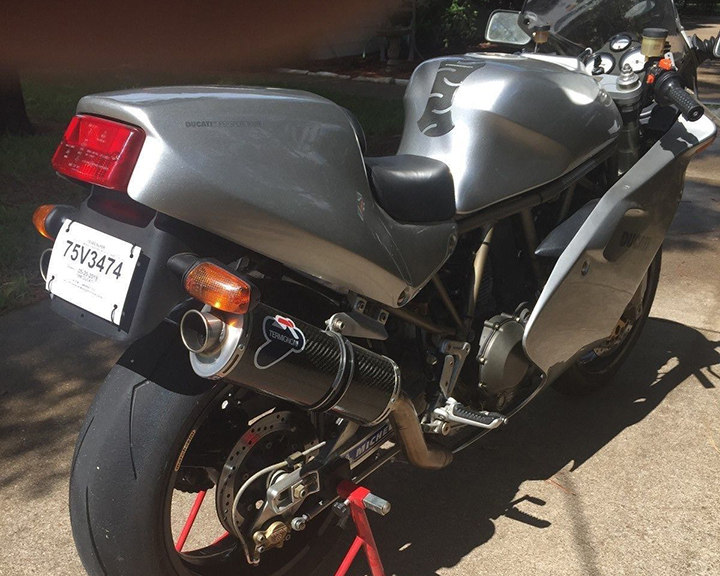 And the M4 exhaust is perfectly fine on a GSX-R750 but a "classic" Ducati? But all that is relatively easy to change to suit the new owner's preferences anyway. 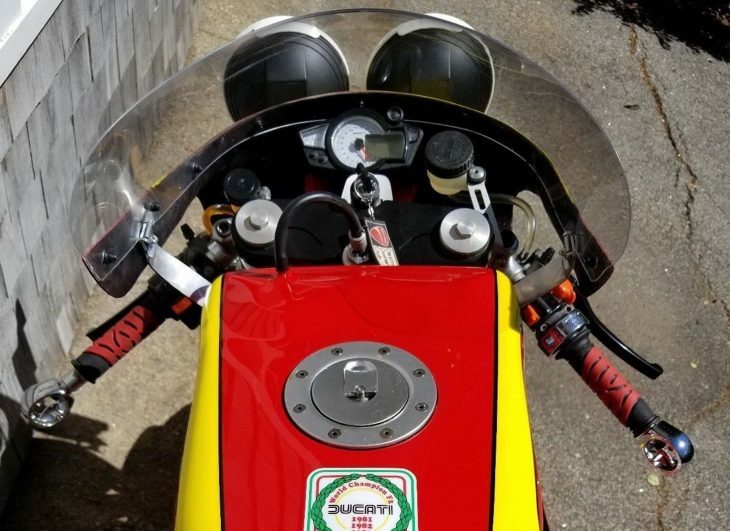 If it sounds like I don't like this bike, you'd be wrong: I'm really just picking nits and all of these minor issues are easily forgotten, looking at the red-and-yellow bodywork and those awesome endurance-racing headlamps. 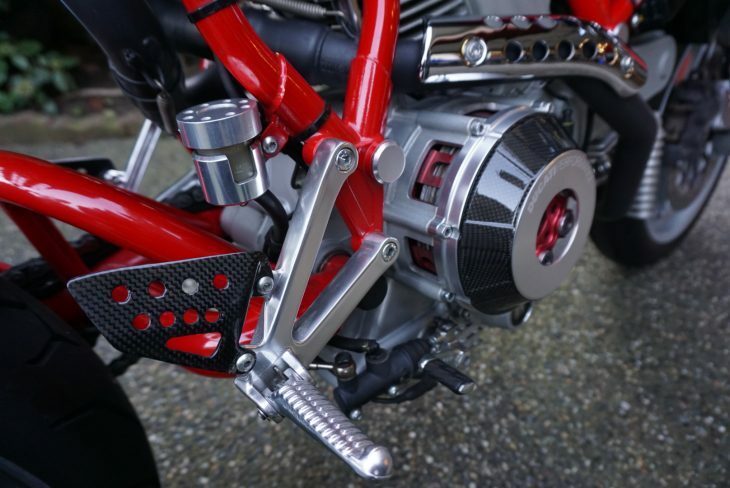 And although the listing doesn't go into too much detail regarding the engine, the Pantah engine can be tuned to make good power and, in a lightweight package, should make for a very entertaining bike. 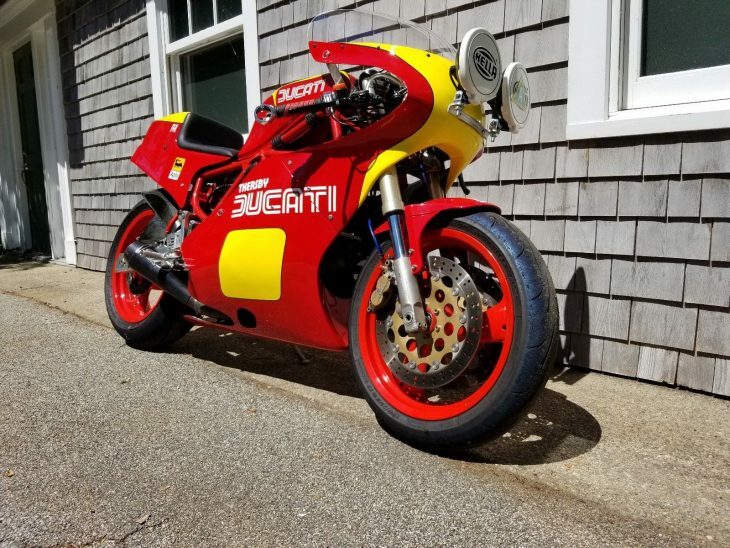 For the Ducati connoisseur, this beauty will enhance any collection. 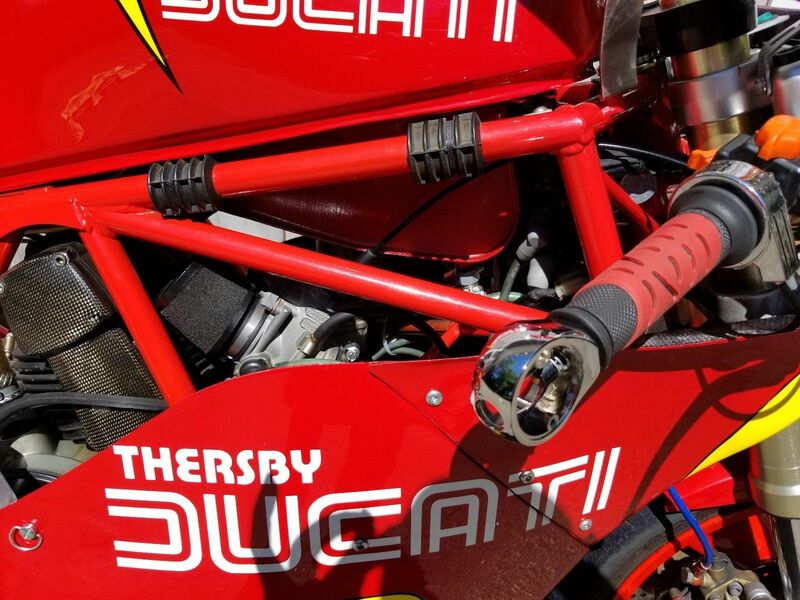 Frame came from British Ducati legend Roy Thersby. 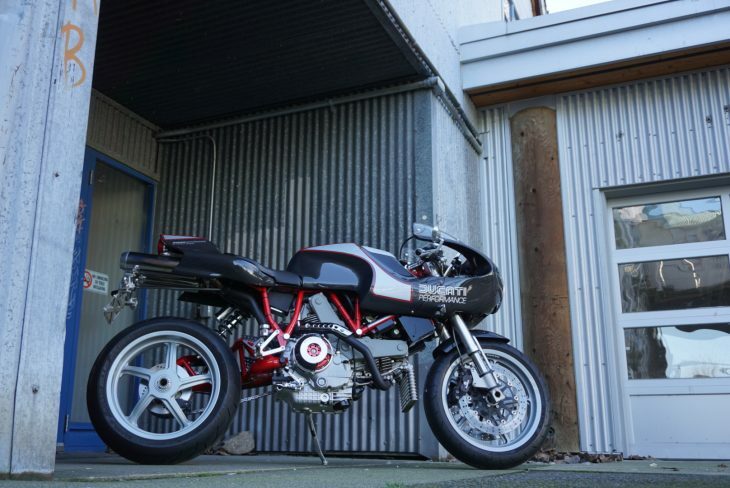 The bike was built by vintage Ducati guru Scot Wilson as his personal ride. 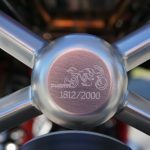 Scot is the owner of Italian Iron Classics in Tucson, AZ. I've had the pleasure of owning a couple of Scot Wilson's builds and they are very carefully planned and meticulously executed. The 750 engine was built by Tom Hull of Phoenix to "Pro-Thunder" standards with Carrillo rods, dual spark, lightened internals and all the special bits you'd expect. The engine was moth-balled after a rule change, acquired for this build and has about 1,000 miles on it. 40mm Del Ortos, fork set by Computrack. GP shift but could be changed. The bike was just serviced, all fluids changed, fuel tank cleaned, carbs cleaned and carefully checked over. It's ready to go. 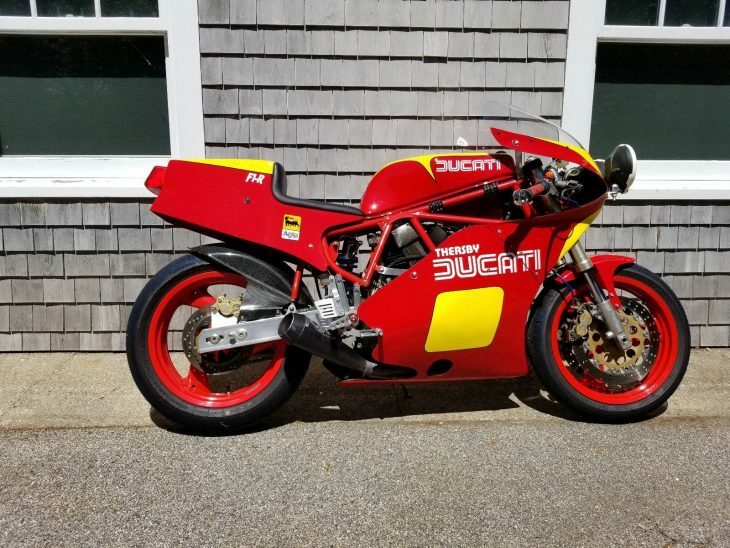 The bike is street legal, has a clear Massachusetts title and goes like crazy. 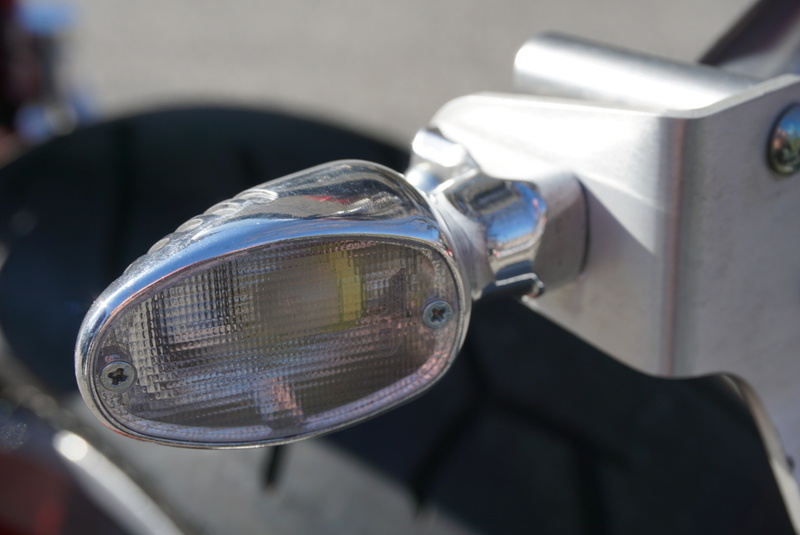 Headlights are Hella style as used for endurance racing. 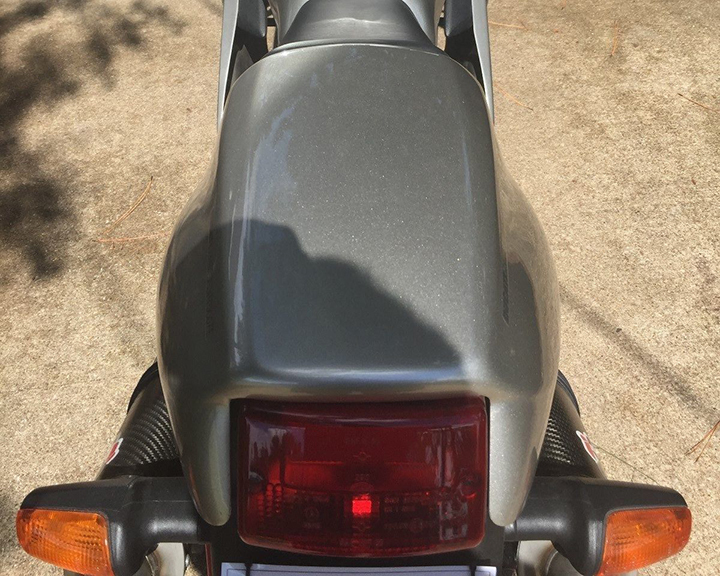 Bar-end turn signals are installed so the bike will pass my state registration inspection. The paint is as good as it gets and looks as fresh as the day it came from the painter's shop. 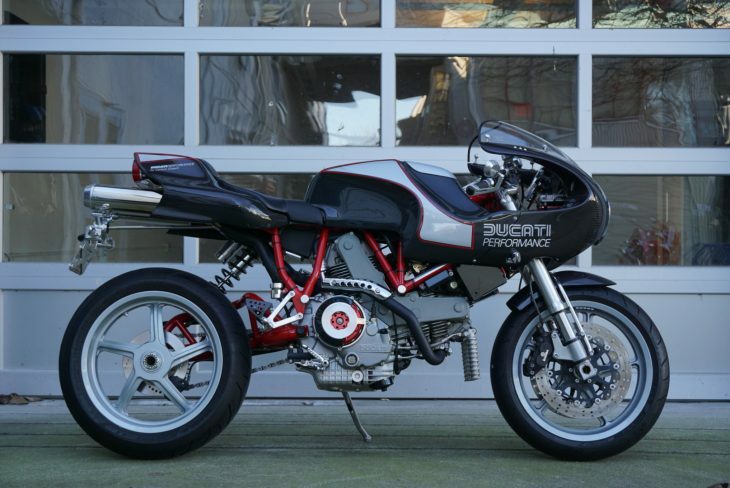 If you are looking at this bike I don't have to tell you about Ducati F1-R's or TT2's. 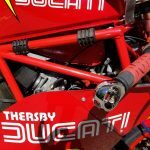 I've had the opportunity to do a (very careful) track day at a Ducati event and the bikes gets lots of attention. If the track's not your thing you could proudly show it at any event and it would draw a crowd. 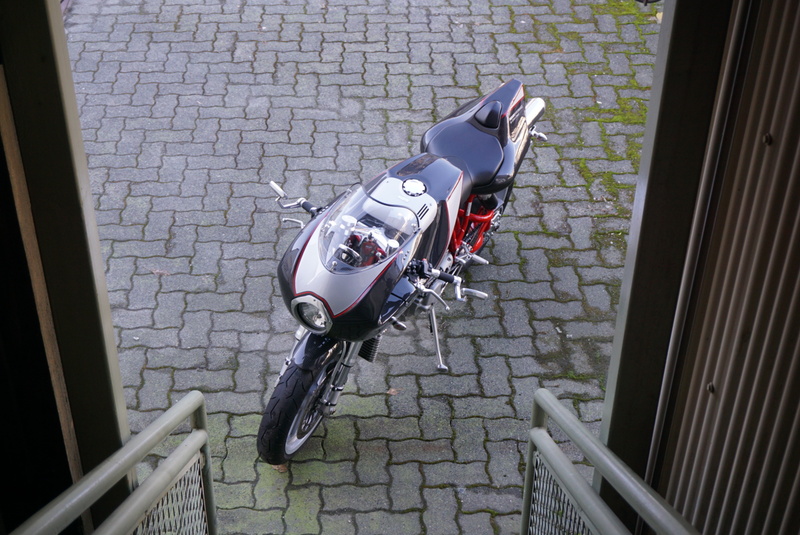 While undeniably cool, bikes like this are always tricky when it comes to determining value. 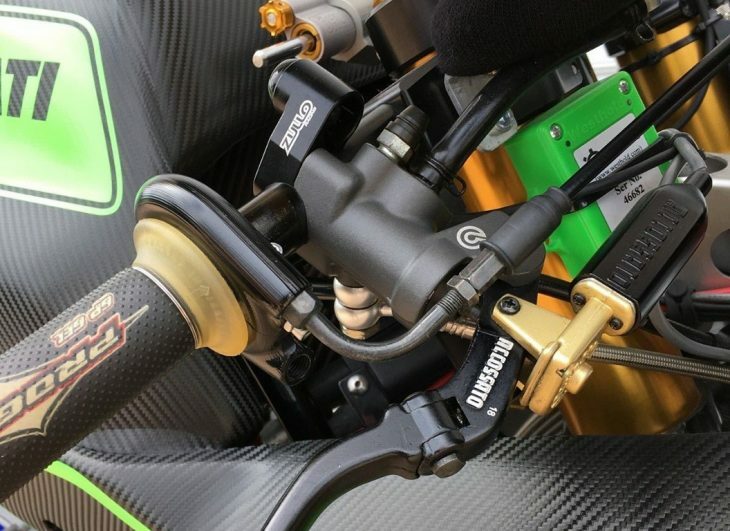 They're not collectible in the conventional sense, in that they're not real race bikes or limited-production factory machines: they've been built using high-quality components, but they're basically really nice lash-ups, "bitsas" made from the very best bits. 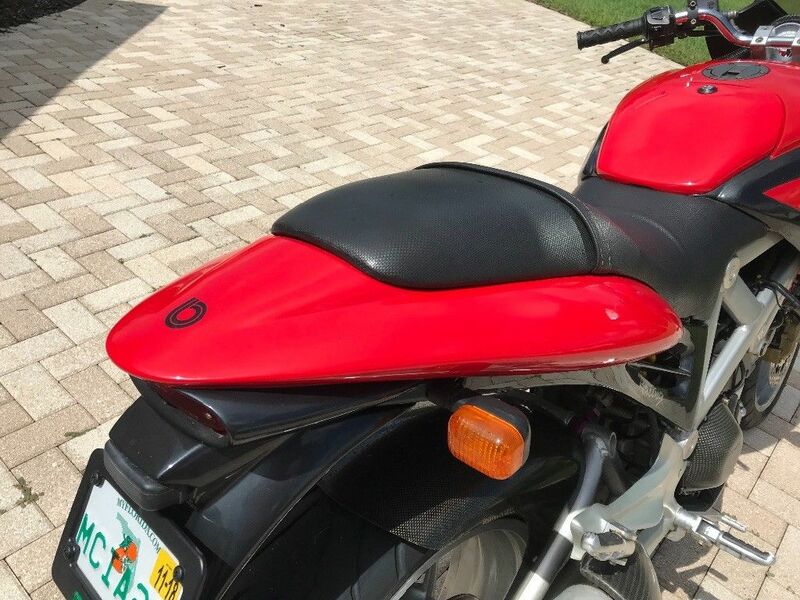 Of course, a real TT2 would likely sell for far more than the $22,500 the seller is asking, and considering the quality and names attached, I'm thinking this is a pretty damn good deal as long as the lack of originality doesn't bother you, and you're ready for the snobs to give you static when they ask you "is it real?" But honestly, if anyone gives you a problem, you should just blind them with those massive Hella lamps. Italian bikes are sometimes accused of putting style before function, but I think it's more accurate to say that they prioritize performance and style over comfort and practicality... But in the case of the Ducati MH900e, style was far and away the most important priority, and everything else came after. 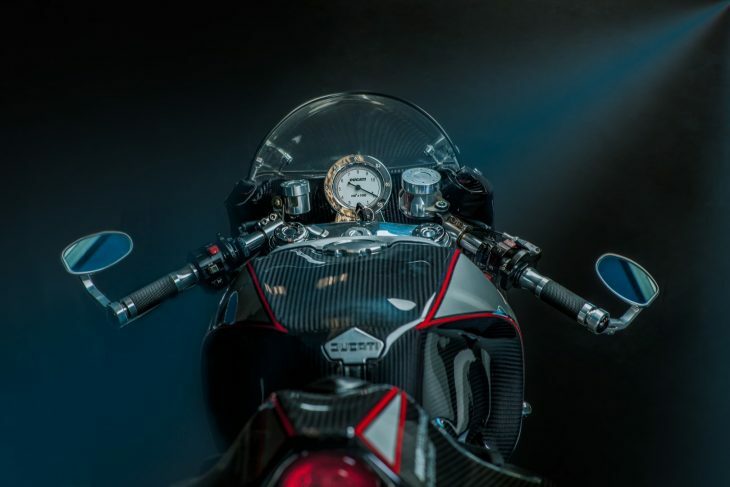 Penned by Pierre Terblanche, the MH900e was meant to evoke Mike "The Bike" Hailwood's race-winning Isle of Man TT NCR-prepped machine and the replica MHRs that followed. 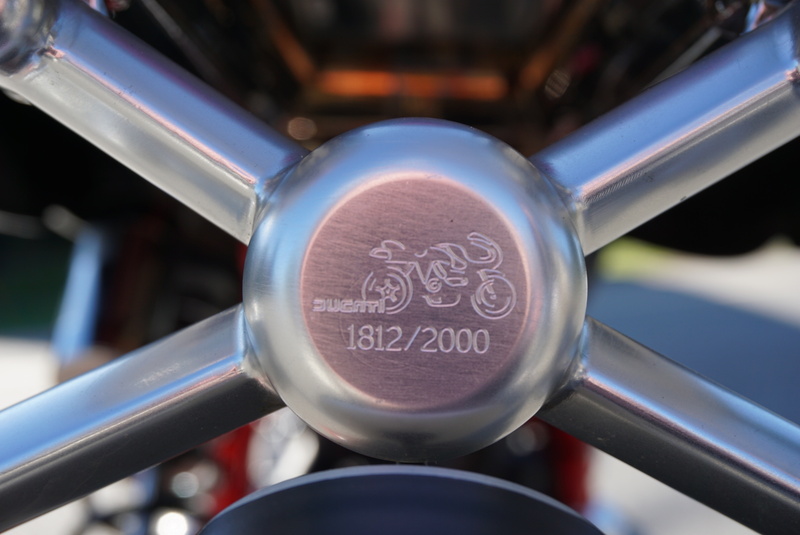 The "e" at the end of the name was for "Evoluzione" as the bike is the spiritual successor of those storied machines. 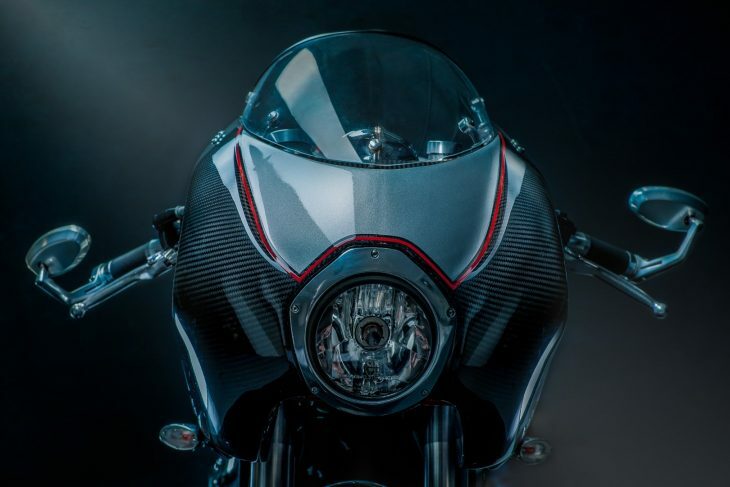 The MH900e's concept bike looks are wild and impractical, but its beating heart is Ducati's long-serving oil and air-cooled two-valve L-twin. Displacing 904cc, the twin pumps out an honest 75hp at the rear wheel along with respectable midrange torque. 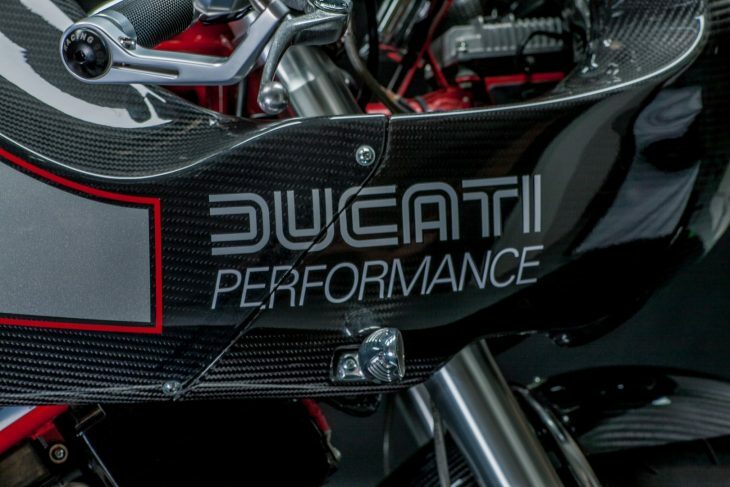 It's obviously not a powerhouse, but the 410lb machine has Ducati's race-bred frame geometry and quality suspension at both ends. 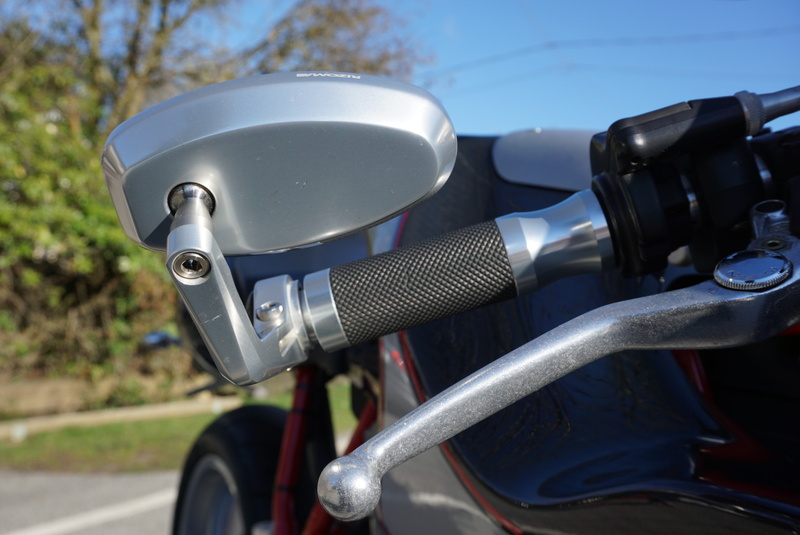 The riding position is committed, with a long reach to low bars over the tank, high rearsets, and a tall seat that requires long legs if you want to put your feet flat at traffic lights. 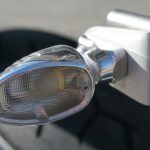 Frankly, there are just two things really stopping the bike from being a great back-road bike like the later Sport Classics: the brutal ergonomics and the insane, Harley Sportster-sized fuel tank. The ergonomics you can justify, but the tiny, 2.2 gallon tank means about 90 miles between stops, even with the two-valve twin's surprisingly decent mileage. 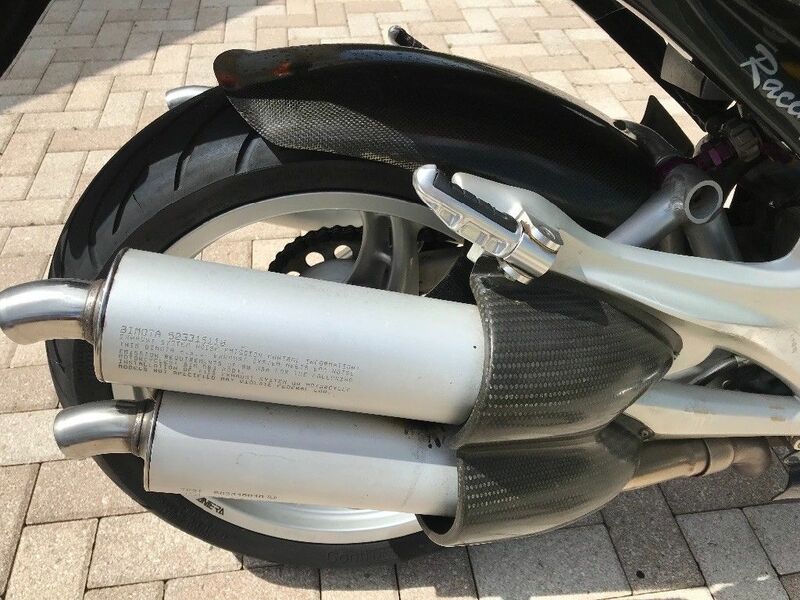 It's a little shocking, since the bike looks like it'd have a generously-sized fuel cell, but most of what you're looking at is apparently an airbox. 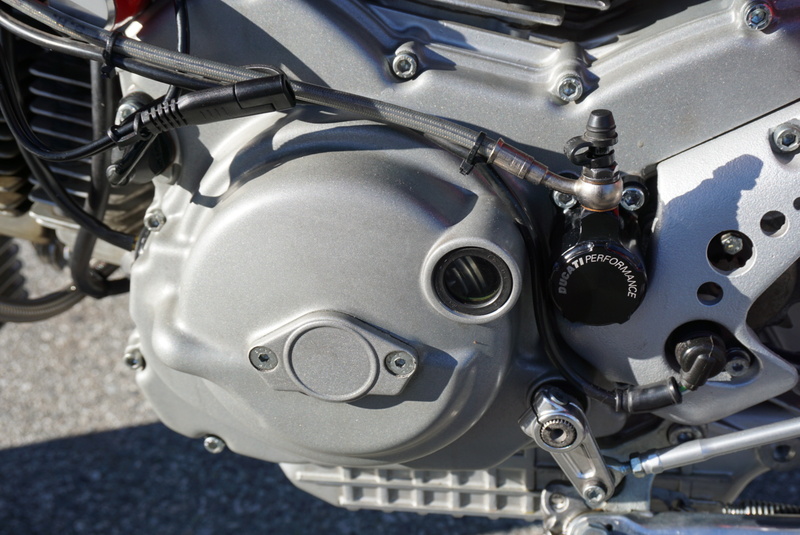 Luckily, California Cycleworks makes a much larger 4.6 gallon unit that doesn't require any permanent modifications to the bike to install. It appears to still be available and would make the bike much more practical. 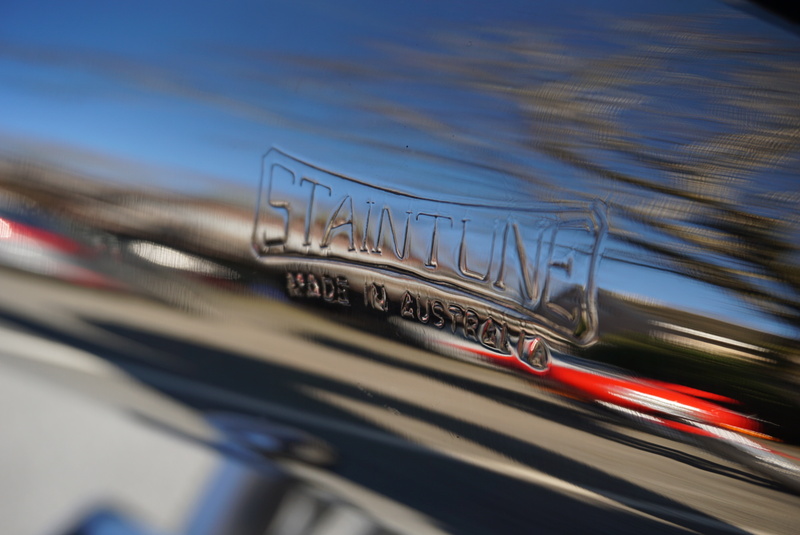 With just 2,000 produced between 2001 and 2002, they're rare and valuable enough that most seemed doomed to a life as display pieces, but that's a shame, considering the excellent handling, solid reliability, and easy-to-service engine. All services done. 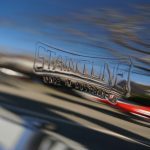 Timing belts changed in 2017. New tires. Needs nothing. Bike is as is and does not come with additional parts. 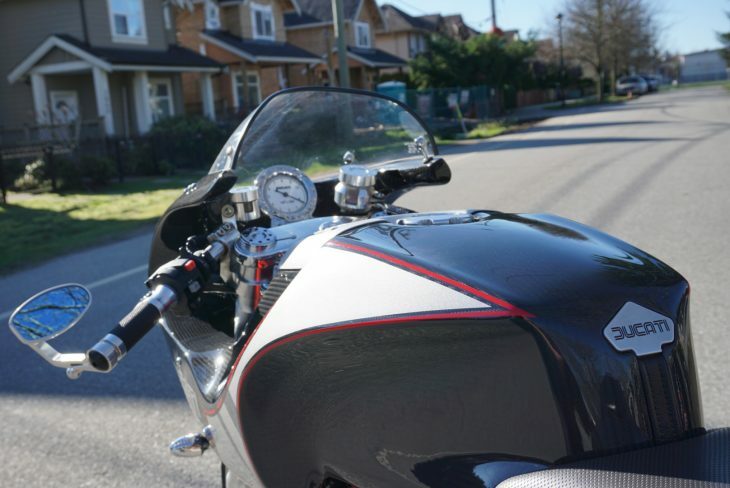 Bike is located in Vancouver BC Canada. Serious inquiries only. No PayPal. Wire or cash only. The bike can be easily exported back to the US because it is an US bike. Shipping can be arranged at buyer’s cost. 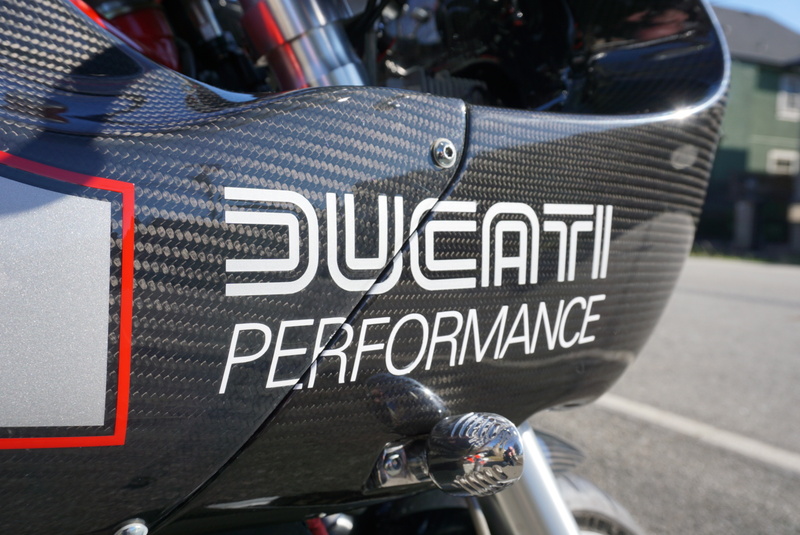 It is unfortunate that the original bodywork and other parts don't seem to be included, but the Ducati Performance panels are obviously an appropriate modification and look great, even if exposed carbon fiber reduces the visual ties to the red and silver of the original NCR bikes. 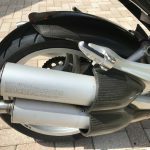 The bike also includes a set of Staintune exhausts that look very similar to the stock system but let the bike sound more appropriately Ducati-ish. 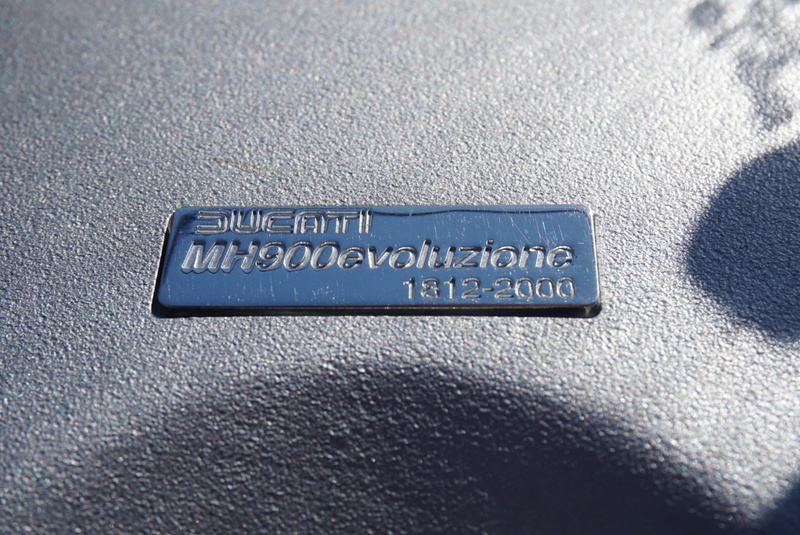 Considering the prices of Sport Classics these days, the $19,800 $18,000 asking price seems pretty reasonable, and is in line with other examples of the MH900e that we've seen lately.